Famed New Hampshire designer/ builder Edward "Ned" McIntosh produced and estimated 200 MerryMacs between 1953 and the late 1960's. The design and construction of these beloved watercraft have stood the test of time, with many of the original numbered fleet still plying the waters along New Hampshire's seacoast and beyond. 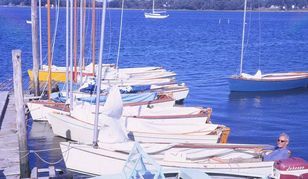 The original fleet (pictured above) spawned the creation of the Great Bay Yacht Club, which recently celebrated its 60th anniversary. Piper Boatworks is building new numbered MerryMacs using Ned's original building molds and patterns. Piper Boatworks also produces replacement parts and components for the 200 numbered originals currently in circulation. If you have a connection to or currently own a numbered original and would like to be part of our MerryMac archive, please complete the contact form to the right. Great Bay Yacht Club Sails Into 60 from Solid State Creative on Vimeo.